(Newser) – NPR is mourning veteran photojournalist David Gilkey, who has become the first American journalist outside the military to be killed in almost 15 years of US involvement in Afghanistan. Gilkey, 50, was killed alongside 38-year-old Afghan interpreter Zabihullah Tamanna when their vehicle was hit by shellfire as they traveled in an Afghan army convoy in Helmand province on Sunday afternoon, the New York Times reports. 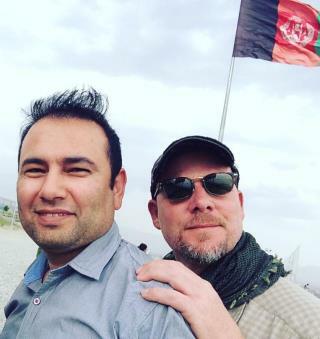 Two other members of the NPR team, who were embedded with Afghan special forces on a monthlong assignment, were unharmed in what authorities say was a Taliban ambush. This is the first time an NPR journalist has been killed on assignment, CNN reports. James P. Hunter, a 25-year-old staff sergeant and journalist with the Army's 101st Airborne Division, was killed in an IED attack in Afghanistan in 2010. After 7-1/2 years, Obama still has US soldiers fighting in Afghanistan and in Iraq. And now there are US soldiers fighting in Africa, Syria, Ukraine, and other places. Obama is the warringest President in US history!!! Peace prize recipient!!! Big deal, he put himself there. Why does a radio network have a photographer?